To freeze, combine first 9 ingredients (chicken through pepper) in a large zip top plastic bag. Label and freeze. To cook after freezing, remove frozen meal from bag and place directly in slow cooker (no thawing needed!). Cook on low 8 hours or on high 6 hours. Shred chicken. Serve in warmed pitas with Tzatziki sauce, cucumbers, and tomatoes. Top with chopped fresh dill, if desired. To cook immediately, combine first 9 ingredients in a slow cooker (chicken through pepper). Stir well. Cook on low 6 hours or on high 4 hours. Shred chicken. 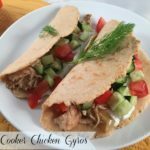 Serve in warmed pitas, topped with Tzatziki, cucumbers, and tomatoes. Top with chopped fresh dill, if desired. 8 servings.